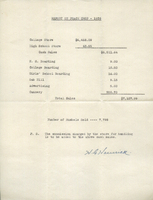 This is a ledger depicting how many bushels of peaches were sold in 1938. 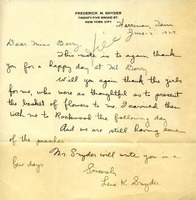 Lena K. Snyder writes to thank Martha Berry for a happy visit at Berry and ask her to thank the girls that gave her flowers. 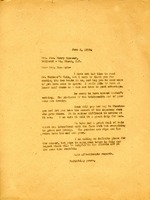 Iva L. Cotton thanks Martha Berry for the Georgia peaches and explains that they are much better than New York State peaches. Ms. Cotton also wishes to thank her on behalf of herself and Marie S. Leahy for their previous visit to the Berry Schools, as well as to inform her of their plans to visit again in the near future. 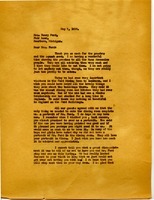 Martha writes to Mrs. Ford to thank her for the peaches and the squash seed. 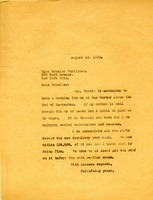 She also writes to tell her about the visitors in the Ford Dining Room, and how disappointed that she and Mr. Ford did not stop by in the spring.